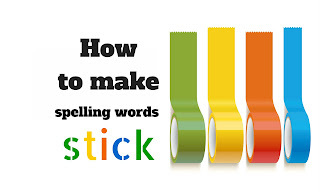 Little Leaps of Learning: How to make spelling words "stick"
How to make spelling words "stick"
Today I wanted to share just one way I use to help my class remember their spelling words for the week. Each and every day I have my class revisit the spelling rule or pattern and then the corresponding words. I do this by using everyone's favourite program... PowerPoint! We use the PowerPoints as a whole class, with everyone participating and reading aloud the words together. The PowerPoints only come out AFTER I have explicitly taught the spelling pattern. (This is the 'Warm up' format that I will post about another time). 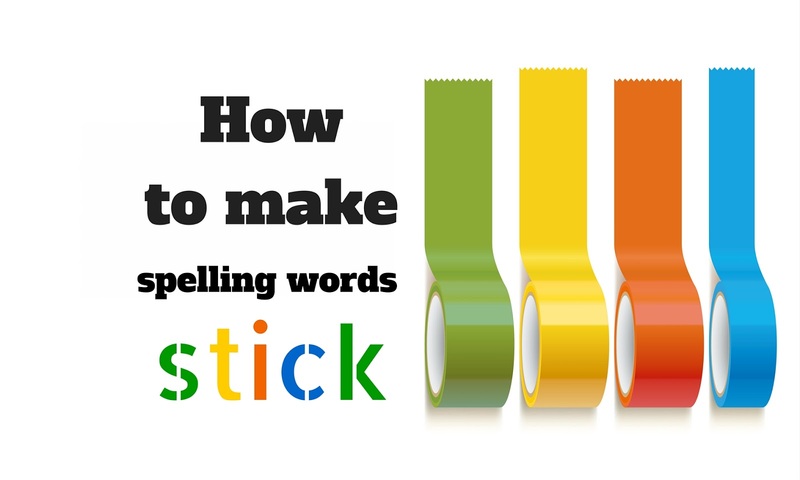 First, it displays individual words with the intended spelling pattern in a different colour (for those visual learners - myself included!). The students do a 'Say and Spell', where they read the word aloud and then spell it. Just like those spelling bee contests: "Singer. S-I-N-G-E-R. Singer". Sometimes we add in claps or clicks with each letter. Sometimes we stretch out the sound in the word to count the phonemes. Other times we might read the word and clap the syllables. 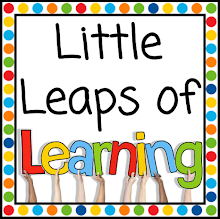 The possibilities are endless and the variety keeps us going throughout the week, each day as we practice the words. For added excitement, sometimes I will ask for "just the girls" to choral read the next few slides and then switch to the boys - just to break it up. I also have 5 Bonus Words - words that use the spelling pattern/rule but aren't on the week's spelling list! For the right/wrong slides, we use hand actions to show what word is correct. The students point their thumb left or right, and it is done silently which gives me a chance to scan the responses. The very next slide has the correct answer highlighted for immediate feedback. There is always lots of cheering if they chose the right word! These slides are a great chance to reinforce visual spelling knowledge. For the multiple choice slides, we also use hand actions to show our chosen answer. I love hand actions, and so does every single class I have met! Hands on heads for A, hands on torso for B, hands on knees for C (sometimes I have an option D which is toes). This allows for students to silently show me their answer without giving it away for others who are still thinking. Hopefully you see how versatile and engaging these PowerPoints are. They are perfect for revisiting each day throughout the week. You can use just part of it one day, or do the whole PowerPoint in a different way each day. I want to help make Term 4 easier for teachers, so therefore I've made my spelling PowerPoints (for Years 1, 2 and 3) free for my Facebook fans. They are aligned with the Australian Curriculum. 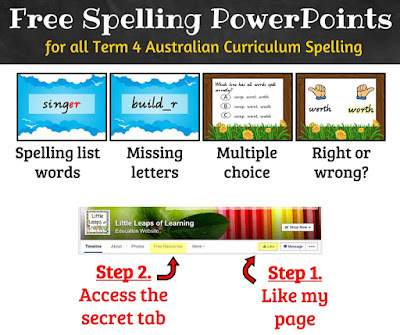 Make sure you head over to my FB page here to get your free PowerPoints for the rest of the term!